76942 Antique Arraiolos Rug with Palampore Style, Portuguese Needlework Rug 09’11 x 10’04 From Esmaili Rugs Collection. This antique Portuguese Needlework Rug features an allover lattice pattern set with floral sprigs and diamonds at the interstices. A row of round tricolor mounds frames the carpet edge, creating an organic border. This Antique Arraiolos Rug is suitable for a variety of interiors especially farmhouse style interiors with rustic and bucolic charm. 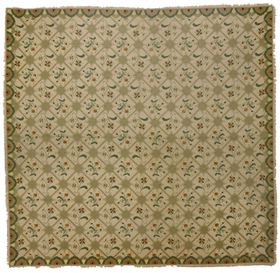 This Arraiolos needlepoint rug has some influence of antique palampore tree-of-life hangings and bed-covers made for the western market. Imagine this Portuguese rug in a South Hampton cottage bedroom or lake house foyer. Made in Portugal. Measures: 09'11 x 10'04.